When someone asks the address of your house, how nice it will be, if you can point them to the tallest building in town, that is visible from anywhere in town and say "Look there, that is where I live!" Turning Torso is the tallest building in Sweden and is located in Malmo, a nice city south of Sweden, close to the ocean front. 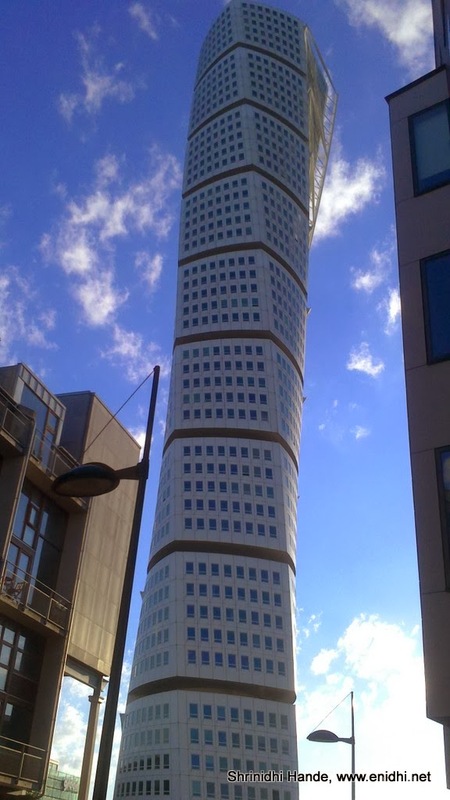 Turning torso is a 54 story building with 9 sections of 5 floors each, having total height of 190 meters. First two segments consist office space and rest are apartment units. Though the building looks great from outside and attracts lots of tourists, it reportedly failed as a commercial venture, because the apartments didn't sell in expected numbers- probably because there's no open balcony or it is too congested from comfortable living. It is possible to rent these apartments as well. Wikipedia says with prior permission tourists can go to top of the tower. But no specific information was available as to when and how to book. So I could only see the turning torso from outside. If so many people are living here, there should have been adequate car parks. But couldn't ascertain how many floors are set aside for parking. You can also watch the video below, from a discovery channel program- extreme engineering, which explains the construction of Turning Torso. Construction work of Turning torso mega structure started in Feb 2001 and completed in Aug 2006.